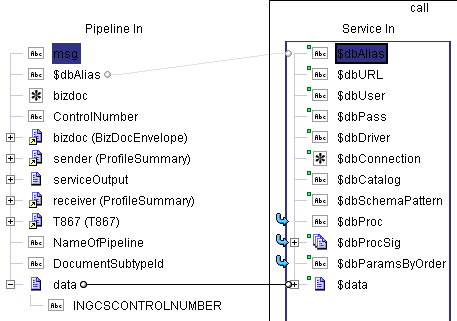 I cannot find any examples of the mappings needed to use the pub.db:call in webMethods 8.0.1. The documentation is helpful, but is barren of any examples. Basically the provided documentation defines little more than name, rank, serial number and description of each built-in service. In the absence of any examples, in the documentation or anywhere else on the web, here is my humble attempt at providing some help. 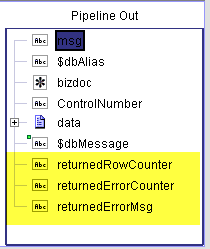 Example 1: A procedure with a single IN parameter. In a MAP flow step, I have mapped the ControlNumber variable shown on the left to the data/inGcsControlNumber variable defined on the right. 4) Click OK to close the dialogs. You now have the parameter defined for the procedure. That’s it. The call is defined and should execute as desired. Example 2: A procedure with IN and OUT parameters. I have a procedure with several OUT parameters that I want to call. 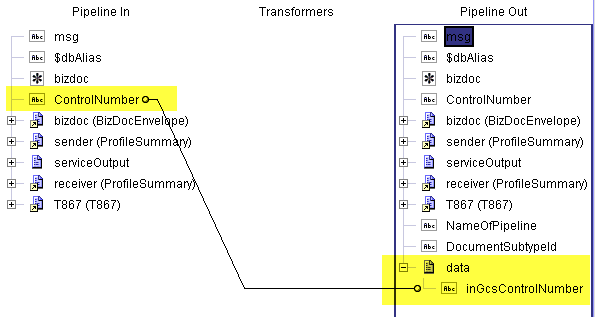 I then want to use the values of those parameters in an email sent by webMethods. 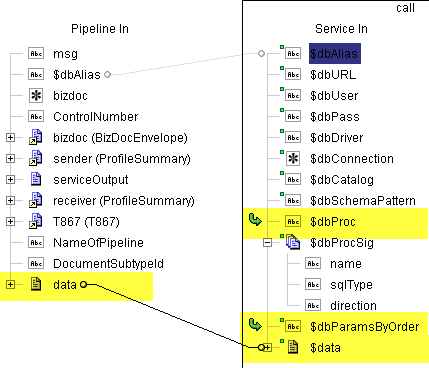 In a MAP flow step, prior to the db:call step, I set up the $data exactly as shown above in Example 1. 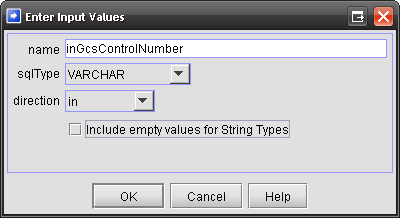 You only need to supply variables for the IN and INOUT parameters – do not supply values for the OUT parameters. Now, that’s it. The procedure is defined and should execute as expected. However, we’re not done yet. Where did the OUT values go? It turns out that at run time, WM puts the OUT parameters in the Pipeline. In this case, you will find outRowCounter, outErrorCounter and outAccumulatedErrorMsg in the Pipeline. 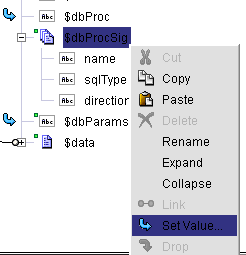 1) After your db:call step, create a MAP step. 2) In the Output channel of that MAP step, create a new String variable, name it something like the first OUT parameter. In my case, I chose returnedRowCounter. Repeating for each OUT parameter, I added returnedErrorCounter and returnedErrorMsg. Now, the OUT parameter values are available to you to do further processing in subsequent flow steps. Hopefully, this will help save someone a week of emails with softwareAG tech support. They did, eventually, help me sort it out, and Deepa gets kudos for putting up with my nagging and for helping the blind to see. Thanks.